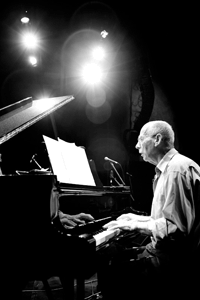 Mike Nock’s new composition ‘SIMA suite’ is a fitting finale to a very productive year for the pianist/ composer. Premiered at Sydney’s Sound Lounge on December 1 and December 8, the suite celebrates the longstanding contribution of the Sydney Improvised Music Association (established in 1984) and features Phil Slater (trumpet), James Greening (trombone), saxophonists Karl Laskowski, Peter Farrar and Mike Rivett, and Nock’s trio partners, James Waples (drums) and Brett Hirst (bass). It was important for Nock to get Slater and Greening involved because of their long relationship with SIMA, ‘plus both of them bring something really special to the music that is beyond just playing the music well. ‘That’s the thing about this music,’ Nock adds, ‘you can’t just write it without the musicians. It’s who you’re writing for. One of the things that I am really trying to do with the piece is to show that it is a living music in that it depends on the people playing it. ‘Music and the notes is one thing and it’s easy enough to put a good band together with good players. But to make something that’s actually going to be a musical experience, that’s going to inspire people, that’s something else. You’ve got to get the right players in the mix. I think that’s critical. The last 12 months have seen Nock working in a variety of different settings in jazz, classical music and film. 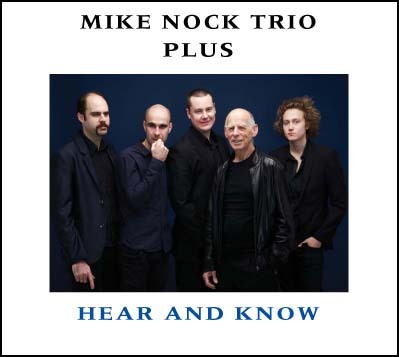 The year began with the release of Nock’s widely acclaimed quintet album Hear and Know, featuring seven Nock originals. In September, the album won first prize in the Jägermeister AIR Awards 2012 for Best Independent Jazz Album. Nock also experimented with a bass-less quartet at a SIMA concert, playing a unique synthesiser sound and developing intriguing bass lines in a series of dialogues with drummer James Waples. Nock also returned to the challenging duo format, which he has always found very satisfying, having recorded albums with drummer Frank Gibson (Open Door, 1987), saxophonist/clarinetist Marty Ehrlich (The Waiting Game, 2000) and saxophonist Dave Liebman (Duologue, 2007). In April, Nock recorded a duo album with US saxophonist Howie Smith, yet to be released. Smith was the first Director of Jazz Studies at the Sydney Conservatorium (1973-76) and co-leader with pianist Roger Frampton of Jazz Co-op, one of the most significant bands in Australian jazz. April also saw the release of another duo CD, Kindred, a remarkable set of improvisations with drummer Laurenz Pike. A regular judge and performer at the Wangaratta Jazz Festival, Nock also performed a stunning duo set of originals and standards with guitarist Steve Magnusson at the 2012 festival. Nock also found time to work on some classical music, extended his writing to classical guitar. His beautiful ‘Cytokinesis’ won Second Prize in the 2011 New Zealand Classical Guitar Competition and was performed by leading NZ classical guitarist Matthew Marshall. A series of collaborations with bassoonist and saxophonist Colin Hemmingsen led to two excellent CDs released at the end of 2011. They demonstrate Nock’s increasing ease at moving seamlessly between jazz and classical music, a task which has proved very difficult for most of those who have attempted it. ‘Sketches’ is a 2007 work in three movements originally written for bassoon, orchestra and jazz trio. The CD features Hemmingsen playing bassoon, alto and tenor saxophone. ‘Transformations’ was first performed in 1986 and an expanded version was commissioned by the Australian Chamber Orchestra the following year. It has been through a series of rewrites before the CD version was recorded in 2010. Originally planned as a 22-minute performance, it doubled in length, with all performers, including the members of the New Zealand String Quartet, taking improvised solos. Nock’s ‘Fictional Realities’ for piano, cello and violin has been recorded by the Apollo Trio and is to be released in 2013 on the Wirripang label. In September, Sue Healey’s film Virtuosi, with a soundtrack by Nock, premiered at the Body Festival in Christchurch. In the film Healey talks to eight other outstanding New Zealand dancers and choreographers living and working in major cities around the world to understand what had driven them to leave their homeland. Nock did not write new music for the film but it successfully combines his interest in both film and dance. His 1984 soundtrack for the NZ film Strata remains one of his great solo albums and he first worked with Healey on The Long fall from Splendour to Splendour(1990), Knee Deep in Thin Air (1992), and Slipped and W. Sonata (both 1997). Nock saw Virtuosi at Fox Studios: ‘It was unbelievable. It really does make a difference when you hear everything with a fantastic sound system with the big screen. I was blown away. I thought it was amazing. It’s basically these dancers talking about why they dance. Despite a busy schedule, Nock found time to record with NZ trumpeter Kim Paterson on The Duende, and he continues to teach at the Sydney Conservatorium. Nock says: ‘I write music all the time, partly because I work at the Con. I’ve got a student ensemble that I write for and everyone in the SIMA Suite group, except for Phil, has been in these ensembles over the years. I always give students something interesting to play but writing is a lot of work for me because I think about it a lot. Whether playing acoustic or electronic instruments, in solo settings or larger groups, in jazz or in classical music, Nock continues to find fresh ways of expressing his lifelong musical journey and continues to inspire his students and fellow musicians.